It’s a miserable day in the fall of 1943. Your company has just taken a muddy hill in Southern Italy. Suddenly, you hear the clank of Panzers rolling up the slope towards your men. Your company doesn’t have enough bazookas. If you stand and fight, your men might be slaughtered. If you give up the hill, you might expose other friendly units to a flank attack. One commander might try and hold the hill because they were ordered to do so. Another might refuse to sacrifice their men and withdraw. A third might even be relishing the idea of a fight against the vaunted Panzerwaffe. These are the different leadership styles we are trying to translate into gameplay mechanics. Hello, we’re Allen Gies and Paul Wang, the writers behind Burden of Command. If you have seen our two minute teaser, you know that this game is about leadership. 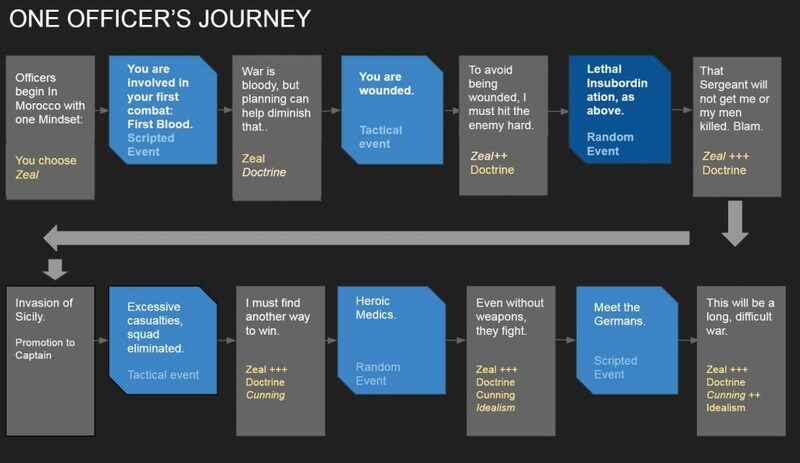 How do you create RPG mechanics which can faithfully depict the thought processes of someone who leads soldiers into battle? Our answer is something called Mindsets. In Burden of Command, Mindsets are a character’s attributes. Instead of measuring strength or agility, Mindsets reflect how a character thinks and sees the world around them. In addition, each Mindset also affects tactical combat. A Zealous officer is more effective when leading assaults, while a Compassionate officer will suffer fewer casualties. All officers start with a Primary Mindset, which represents the way that character thought in peacetime. But war changes a person. As an officer is exposed to the realities of combat, their personality develops as a result. They gain certain new Mindsets, or reinforce existing ones through events we call Crucibles. 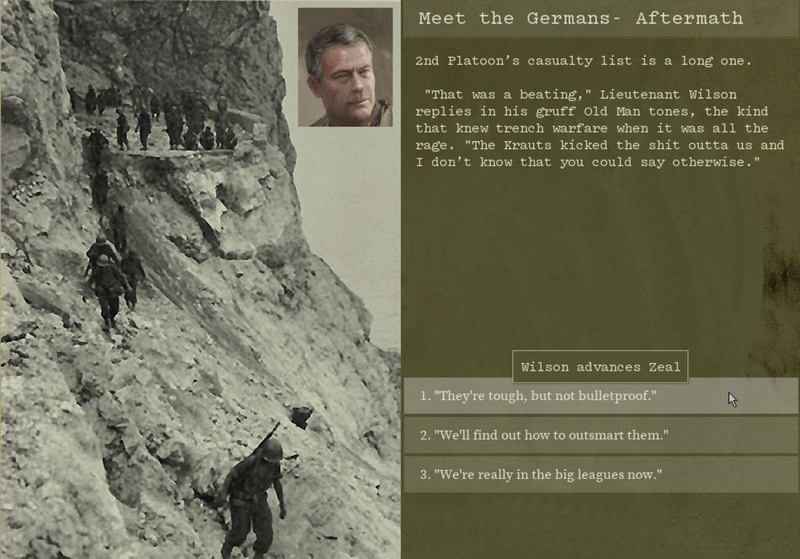 This example is based on an actual event involving Lieutenant Ronald Speirs, of Band of Brothers fame. According to witnesses, Speirs shot his Sergeant in self-defense. Afterward, Speirs reported the incident to his commander, Captain Gross, who ruled the shooting justified after a short investigation (details here). 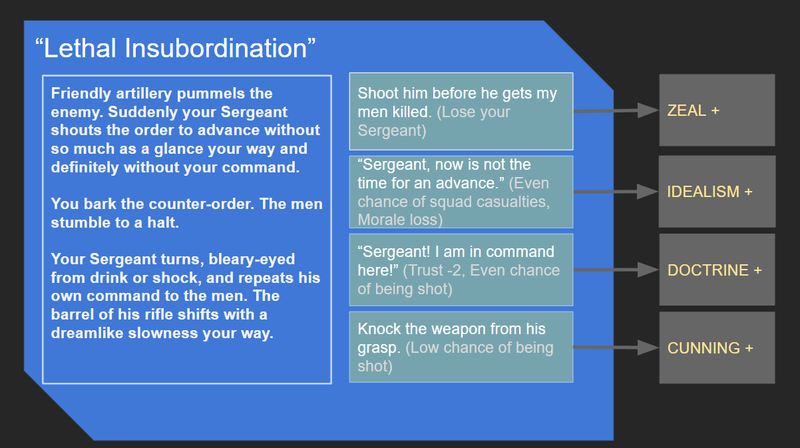 The player’s choices can also affect subordinate officers. Leading soldiers into battle isn’t just about deciding which unit goes where. It also means making hard decisions and living with the consequences. How will you decide when the bullets are flying and lives are on the line? How will your choices define you? Crucibles, Mindsets, Journey. 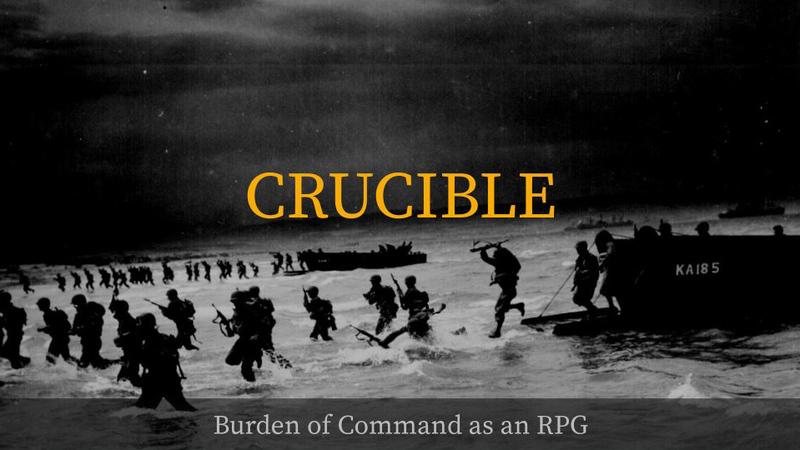 How will you bear the Burden of Command? What Mindsets do you think you’d focus on if your were roleplaying? Please give us your thoughts on Facebook or Twitter, or leave a comment below. Looking forward to it and seems like a cool system! Thanks ans good luck. Man that sounds really cool. Very unique and seems well thought out. Can’t wait to play. Thanks for that kind comment Tom! Tom runs a very interesting Podcast (and website https://goforthandgame.com/). Those interested in WWII historical role playing may be interested in his recent podcast coverage of “Black Orchestra” which covers as a boardgame being in the German plot to assassinate Hitler. © Copyright ©2017 Green Tree Games LLC. Burden of Command™ is a registered trademark of Green Tree Games LLC All Rights Reserved.